These satisfying cannabis-infused biscuits and gravy are a great way to medicate in the morning. 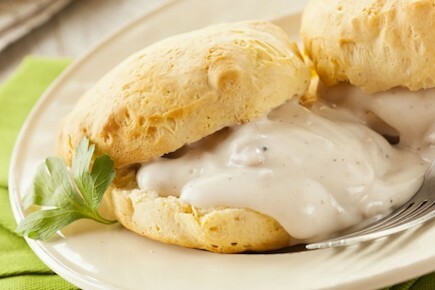 These step-by-step directions will help you make the most delicious Southern Style Biscuits and Sausage Gravy. *This recipe is designed for high tolerance users. Lower tolerance users who make this recipe should substitute regular butter for cannabis-butter in the biscuits recipe. Prepare a floured work surface for shaping the dough and an ungreased baking sheet. Whisk together the flour, sugar, and salt in a medium bowl. Use a fork or pastry blender to cut in the shortening and cannabis-butter. Work quickly to turn the mixture into a coarse, crumbly meal. Don’t handle directly with your hands to avoid warming the butter and shortening. Use floured hands to turn the dough onto the floured work surface and fold it over on itself 2 or 3 times. Shape into a 3/4″ round. Use a 2″ biscuit butter and cut out the biscuits, pressing straight down (not twisting). Place the biscuits on the baking sheet so they just barely touch. Reshape the dough scraps and continue cutting until there is no more dough left. Set aside. Once the pan is hot, crumble the sausage unto the pan and let it brown for a minute or two then turn down the heat to medium. Break the sausage into smaller pieces while it cooks until there is no more pink. Stir in the onions and cook until they are transparent. Add the biscuits to the oven and bake for 15-18 minutes. They are done when edges are golden brown. Sprinkle half the flour over the sausage, and stir until it is all soaked up. Add a little more just before the sausage starts to look too dry. Stir it around and cook for another minute or so, then pour all 4 cups of milk (2 cups whole milk & 2 cups whole-marijuana-milk), stirring constantly. Once the gravy is finished and the biscuits are cooked, top the biscuits with the gravy. Serve immediately.